Wiland Associates is one of the nation's most experienced and premier providers of All-Hazards Incident Management, National Wildfire Coordinating Group (NWCG), and OEC Team Training courses. Our affiliates bring literally hundreds of years of practical, real-world, all-risk experience to the classroom. All Wiland Associates Position Specific Instructors are qualified as Lead Instructors according to the Five-Year NIMS Training Plan and the draft NIMS Training Plan, and are totally familiar with all of the instructional materials. Our commitment to each and every customer is to provide a truly “All-Risk” instructional cadre of seasoned field command specialists with extensive national experience and intimate knowledge of DHS curricula. The goal of Wiland Associates is to utilize the instructional skills, experience and knowledge of each instructor to enhance your training or exercise experience and improve the overall performance of your teams. 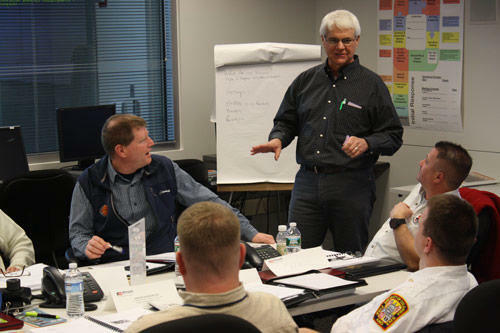 Our affiliates consists of more than seventy-five nationally recognized consultants and trainers who specialize in the development, training, and exercise of Type 3 All Hazard Incident Management Teams nationally. Has been approved through the Department of Homeland Security / Emergency Management Institute All-Hazards Position Specific Training Course Manager. Is an experienced instructor bringing decades of field command experience to the classroom. Possess extensive AHIMT course delivery knowledge and experience. Is a proven educator with hundred of hours of classroom experience. ©2019 Wiland Associates, LLC. All rights reserved.